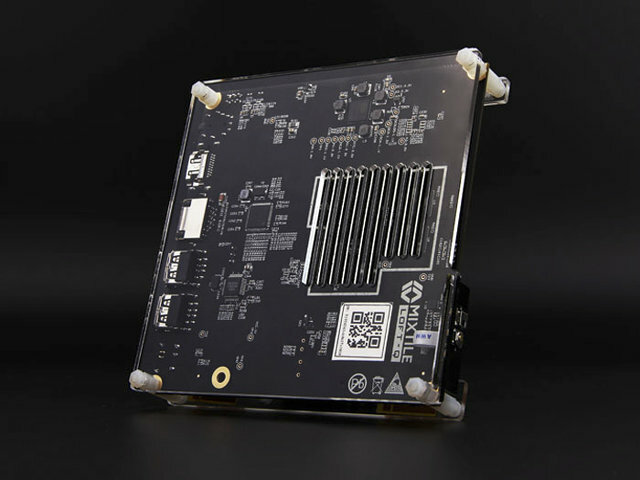 Mixtile LOFT-Q and LOFT Kit were unveiled nearly a year ago, the first being a development board based on Allwinner A31 processor with 2GB RAM, 16GB RAM, SATA connector, Gigabit Ethernet, etc.., while the second is a kit with an enclosure and power supply. The kit does not appear to be available yet, but the board has recently been listed on SeeedStudio for $90. You won’t find many details on Mixtile Hardare page, but there’s some recently updated documentation and software on Mixtile github account, with various repositories for documentation with a getting started guide, linux and u-boot source code, development tools, and BSPs for Android 4.4.2, Ubuntu Touch, and OpenWRT. What I failed to find however is a clear graphical description of the board and connectors. is that sata .. a sata over usb chip ? or is it truly supported? Does it really has support for Openwrt? I can only see the trunk of the official Openwrt and nothing about its support. Finally, maybe not. I saw https://github.com/mixtile/openwrt and assumed they worked on it, but it just seems a fork without modifs. 🙁 is it USB 3.0 to SATA at least? Nope. USB 2.0. No real USB 3.0 on A31.